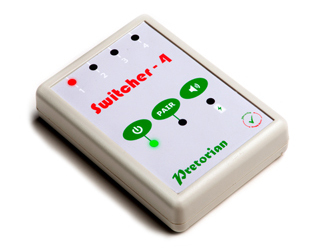 Switcher-4 is specifically designed for wheelchair and lap-tray users needing to access multiple communicators, phones, tablets and similar devices using a single switch. Ideal for users with significantly impaired mobility. 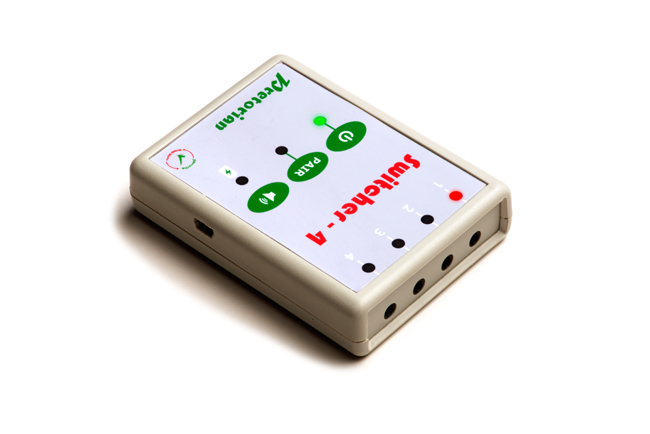 Operates up to 4 devices (communicators, mobile phones, tablet computers etc.) from a single SimplyWorks switch. Visual and (optional) audible alerts indicate which device is connected. Pairing and audible alert settings stored and re-called from a non-volatile memory. Supplied complete with four device cables and one charging cable.